Orange Fleshed Purple Smudge tomatoes are medium-sized, each fruit averaging four to ten ounces, with a round, slightly flattened shape. As the name would suggest, the outer skin is a vibrant tangerine-orange with purple splashes that develop on the upper half of the fruit as they ripen later in the season, and becomes more prominent with light exposure and temperature fluctuations. The orange-yellow flesh has a meaty interior with minimal seeds, and its mild, sweet flavor is well balanced by low acid levels. The Orange Fleshed Purple Smudge tomato plant is an indeterminate or vining variety, producing a steady crop of the unique tomatoes throughout a prolonged season on long vines that can reach an average of four to six feet. It is a fairly firm and thick-skinned tomato, making it a good keeper, and it has been said to be very disease resistant and hardier than some other heirloom cultivars. Orange Fleshed Purple Smudge tomatoes are available in the summer and fall. The Orange Fleshed Purple Smudge tomato is a variety of Solanum lycopersicum that literally gets its name from its unique multi-colored appearance. The rare purple coloration intensifies with more light exposure and longer ripening periods. Like all heirlooms it is an open-pollinated cultivar, hence saved seed of this variety will grow true to type, giving you the same strange yet beautiful fruits year after year. Tomatoes are a good source of calcium, iron, and vitamins A, B and C. The fiber, potassium, vitamin C, and choline content in tomatoes all support heart health. The purple skin of the Orange Fleshed Purple Smudge tomato boasts high levels of anthocyanin, a disease-fighting compound that can help fight cancer, reduce inflammation, and slow the aging process. The mild sweet flavor of the Orange Fleshed Purple Smudge tomato has low acid levels and is excellent sliced and eaten raw. Serve in salads, snack on them as is, or use them for making preserves. Tomatoes pair well with soft cheeses and savory herbs, as well as some dessert style herbs like mint and lemon balm. Store tomatoes at room temperature until fully ripe, after which refrigeration can slow the process of decay. Allegedly, Orange Fleshed Purple Smudge was the only domestic tomato showing a true purple color before the introduction of the blue tomatoes. 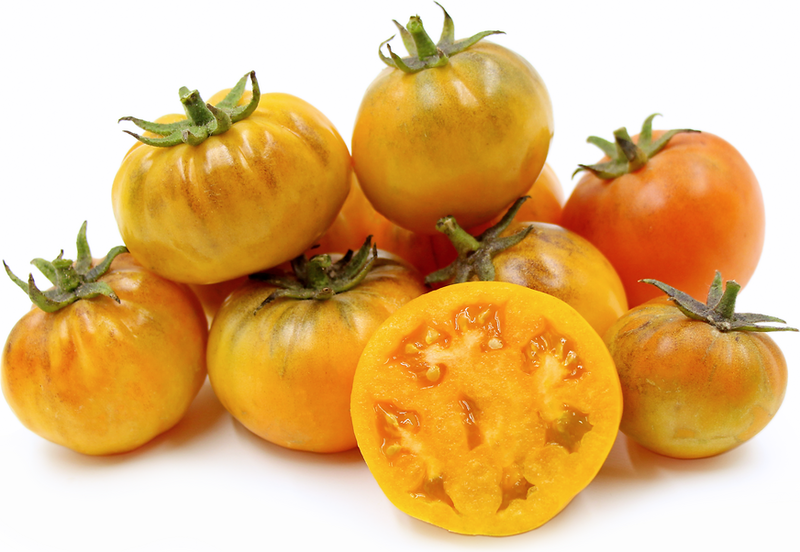 Prior to the research and breeding pioneered by Dr. Jim Myers of Oregon State University in the United States, Orange Flesh Purple Smudge was a rare oddity thanks to its natural deep-purple coloration, which has now become the popular focus for breeding blue tomatoes. The Orange Fleshed Purple Smudge tomato was first donated to the USDA seed bank by Texas A&M University in 1963, and was first listed in the Seed Savers Yearbook in 1984. It has been said to grow well in USDA Hardiness Zones 3-11, and reportedly prospered particularly well on the coast of California as the second orange tomato to start producing in the wine country. Recipes that include Orange Fleshed Purple Smudge Heirloom Tomatoes. One is easiest, three is harder.